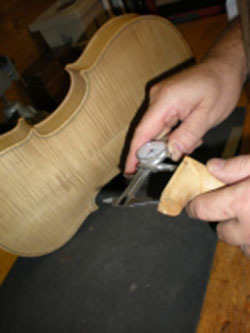 Repairs and restorations are the very heart of The String Tree. With 25 years of experience, president and luthier Ron Procopio heads and operates one of the finest and most experienced shops avaiable. The String Tree stands out among repair shops due to its high level of repair in both orchestral (violin, viola, cello, bass, and bows) and fretted ( guitar, bass, mandolin, electric, acoustic, etc...) instruments. Few shops are capable of performing high level repairs on even one category of instrument, let alone both. The String Tree is also one of few shops performing repairs for both individuals and industries. Many companies, dealers, and repair shops utilize our service because of our superior level of repair, and effeciency. Mr. Procopio attributes most of his success to his German and Italian ancestory, and the oppurtunity to pursue his passion at such a young age. Both sides of his family heritage were prominent Craftsman, Artisans , and Musicians . "I only had one path to follow," explains Mr. Procopio. "I knew what I wanted to do at a very early age. I thank my parents for their patience, understanding , and encouragement. Because of them, I was able to start honing certain areas of my craft at an age where most craftsmen hadn't even started yet." The String Tree has performed repairs for both local and international customers, reaching as close as neighboring musicians, and as far as performers in Egypt. We have been called Berks County's "best kept secret," due to our minimal advertising but yet extensive workload.